This week on the Sam Acho Show, in addition to the usual shenanigans with Bobby Mac and great insights from our other guests, we talked about our team’s big win last Sunday. Obviously, I love it anytime we win. But this week it was extra sweet, since the win came against my brother Emmanuel and his team, the Philadelphia Eagles. I love my brother and I’m just about his biggest fan—that is, until we square off against each other like we did last weekend. At that point, it’s all about bragging rights. I sat down with my brother to catch up and do a little pre-game trash talking, which I thought I’d share with you. This week, to celebrate this amazing play (among others) from our win against the Raiders in Oakland, I welcomed Stepfan “KULABAFI” Taylor onto The Sam Acho Show. I asked him what it feels like to be such an important part of our team’s offense, and then we played a friendly game of ninja. Here’s the segment with our conversation. You can watch the entire show here. 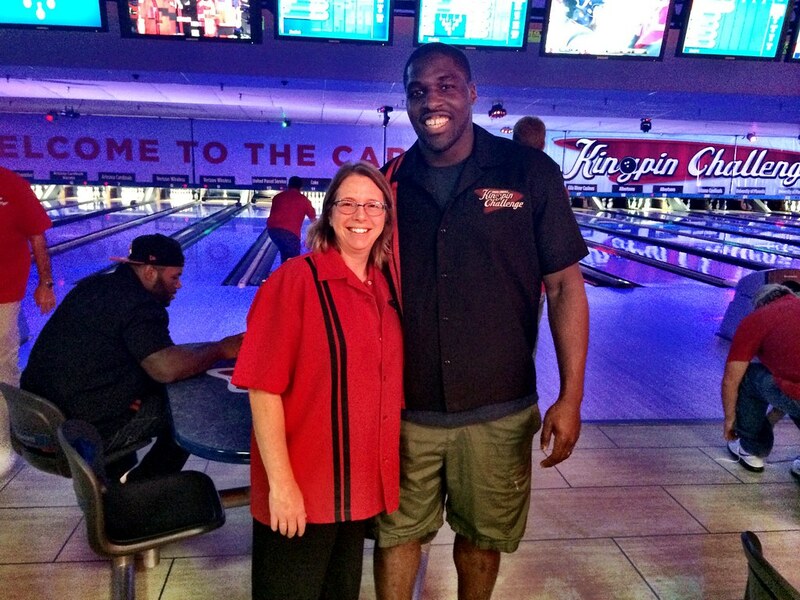 Had a blast bowling with Carrie and the rest of the crew at the Cardinals bowling event. Great time! 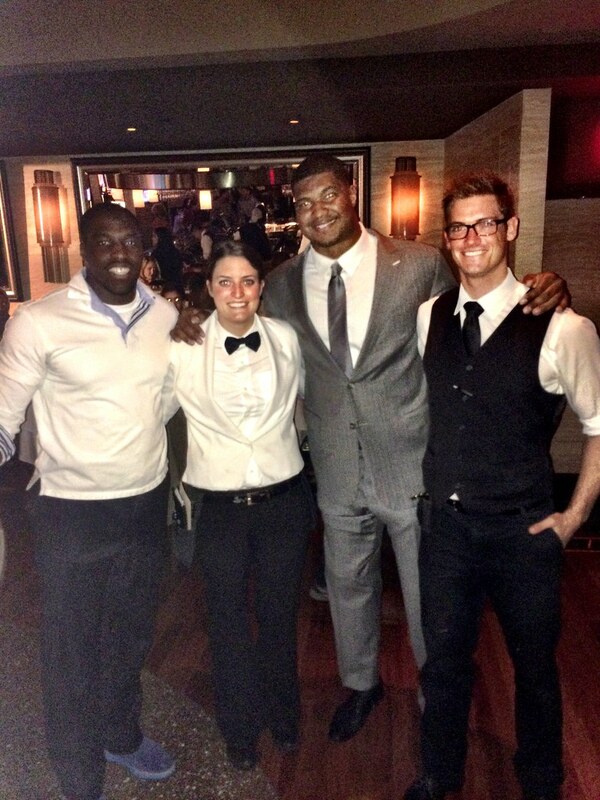 This week, I welcomed my teammates Rashad Johnson and Drew Stanton onto The Sam Acho Show. For those who don’t know, the show happens every Tuesday at 7pm at Native Grill and Wings in Glendale, and is streamed live at azcentral.com and azcentral.com/sports. If you haven’t joined us in person or watched online yet, please do! During the show, Shad and I talked about the “memorable” halftime speech we got during Sunday’s game, and then Drew told us what it takes to be ready to step in as quarterback at a moment’s notice. Also on the show, Bobby Mac and I shot an intense game of pool, Jeff Coruccini gave us a rundown of his fantasy football tips, and azcentral sports columnist Bob Young joined us as well. Here’s the segment with Shad, including a no-holds-barred singing competition. As many of you have heard through social media, a few weeks ago I launched The Sam Acho Show presented by The RoomStore. It’s a one-hour show filmed each Tuesday at 7pm with a live audience at Native Grill and Wings in Glendale and streamed exclusively at azcentral.com and azcentral.com/sports. It’s been a dream of mine to have my own show and I’m loving the opportunity to host special guests, talk football with experts, do some trash talking, and especially the chance to interact with fans like you. Each week, I invite teammates and other athletes to join me on the show. So far, we’ve had Calais Campbell, Darnell Dockett, Antonio Cromartie, and Chandler Catanzaro, and we’ve got a lot of other great guests coming up. We also talk football each week with sports gurus like Bob “AZ Bobby Mac” McManaman, Paola Boivin, and Dan Bickley of azcentral sports, as well as Jeff Coruccini of Fantasy Football Starters. For those who aren’t able to watch the show live, individual segments are also available on demand at azcentral.com following each show. The opening segment from this week’s show is below. We are 3-0 and I could not be more excited. It’s hard to win in the NFL, and it’s even harder to keep on winning. One main reason that teams can’t win consistently is complacency. We recently had a Marine veteran speak to the team. He talked about his time at war and how the game we play is very similar to that. Obviously there is no imminent danger of the loss of life, but he compared our preparation time, reliance on each other for success, and our intent focus on one singular goal: winning. He drove home the message that “complacency kills,” and that the reason great teams often fail is a result of complacency. Our team has taken this saying to heart, and though we are 3-0, you would never know it behind the scenes. We are being coached harder than ever and being held to an even higher standard than when we started this journey. Meeting these standards, though necessary, can be grueling. There is a lot of pressure to perform and I found myself getting lost in it all. Trying so hard to get the job done and not focusing enough on the process. The bye week could not have come at a better time for me. During a bye week NFL players are required to have at least four days off. Every person spends those days differently. Some lift weights, some watch film, some rest their bodies. I took those four days and went to New York with my wife. More than a vacation, New York was a time for me to take a step back and see the bigger picture. Sometimes you get so caught up in this conundrum that you lose sight of what’s really important. In our league, it’s winning. It’s also about focusing on getting better every day and affecting the lives of those around you. New York reminded me of two things. First, it’s a LONG season, so I shouldn’t get overly caught up in the now. And second, it taught me to be patient, trusting that God is in control. Things are gonna happen on His timing, not mine. In the meantime, let’s go get win number four!